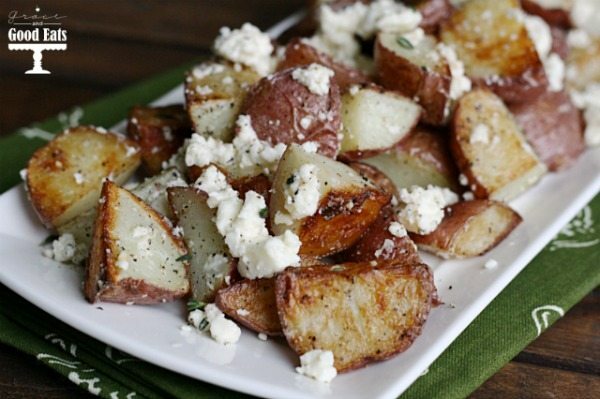 Feta Roasted New Potatoes are a simple side dish for any meal. Roasted baby red potatoes coated with tangy feta cheese and fresh thyme. Kid-friendly mashed potatoes used to be my go-to side when making pork chops or grilled chicken breast; but since finding out that Isabella has an intolerance to white potatoes, James and I have started getting creative now that it’s just the two of us eating. Obviously, one of the easiest ways to spruce up potatoes is by adding cheese. I love new potatoes- so for recipes like this where the potato is the star, I typically use baby reds because I don’t mind eating the skin. James eats the skin of regular russets, but I just can’t do it. 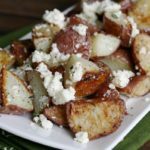 Feta Roasted New Potatoes- baby red potatoes tossed with feta and fresh thyme. Such an easy, but impressive side dish! Preheat the oven to 425 degrees F. Place a baking sheet in the oven to preheat while you prepare the potatoes. Toss the quartered potatoes on a baking sheet and coat generously with olive oil, salt, and pepper. Roast the potatoes until golden brown and crisp on the outside but fork-tender on the inside, 18-22 minutes. Transfer to a large bowl and toss with the feta and thyme to coat thoroughly. Serve immediately. Love feta? Try my Baked Eggs with Tomatoes and Feta or Bacon Feta Penne Pasta. 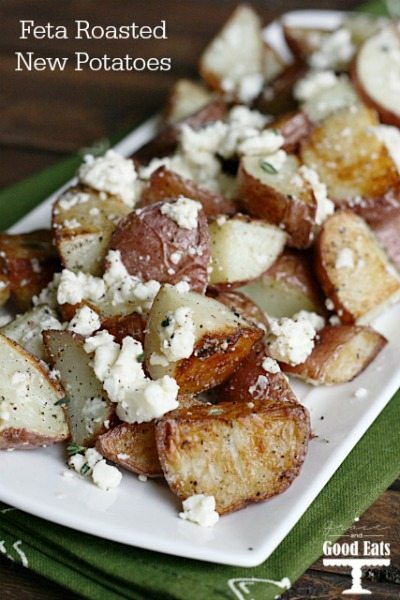 I love feta, so I’ll have to try this next time I make potatoes! Thanks for sharing at Merry Monday! I love feta and thyme! I can’t wait to try these! Pinning for sure !